Are we done with High Waist Shorts? Shhhhhhh…..maybe they’ll just go away. That’s what I said about a year or so ago when I starting seeing women wearing high waist shorts. I believe I first spotted them on fashion blogs and sites like Lookbook. That’s right, I’m confident enough where I can sit at a pub with a pint while perusing through the world wide web of fashion. It wouldn’t stop me from wrapping a cue stick around your head, if need be. I appreciate the fine female leg. But not in those things. You know what’s sexier? A girl wearing sweatpants rolled up to the knee. Maybe I’m reminded of my Uncle Morty, who I think invented high waist shorts. Not only invented them – he wore them. Morty was a brutish, odd Irishman. He looked like a Celtic version of Ernest Borgnine. At least from the waist up. Morty had hair all over his body except for most of his head and his legs. That’s right. His legs. Morty would take these old man pants or jeans and cut them into homemade shorts. 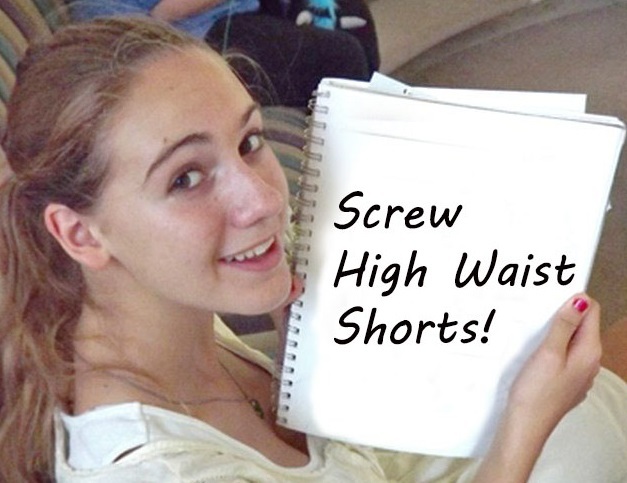 High waist shorts. He said his legs were never able to grow hair, unlike the rest of his flesh. But most of us figured he shaved his legs. I just remember those odd shorts. My first look at high waist shorts. On his body. Now when I see these kinds of shorts on women I think of Morty sitting at the pub, his legs crossed, shirt tucked in. He’d smoke a cigar and rub his legs. Morty’s dead now but those shorts live on. Although I think they’re fading out. Unfortunately they seem to be replaced with a similar style only with buttons that run up the middle in one row or two. They look like someone made cutoffs out of a Civil War general’s coat. I’m still hoping for an end to the giant sunglasses that women are fond of. Enough already. One can never get enough of plaid, tartan and kilty skirts. Ponytails will always, always be hot. And don’t be afraid to wear one with a baseball cap. Less heels and more cute Doc Marten-style boots.